Here's Tasha marveling at the château in Lapalisse. Well, not. She's actually looking in the direction that Ken went, waiting for me to take the photo so we can catch up to him. Tasha keeps her eye on the spot where Ken disappeared. The photo is a little distorted. 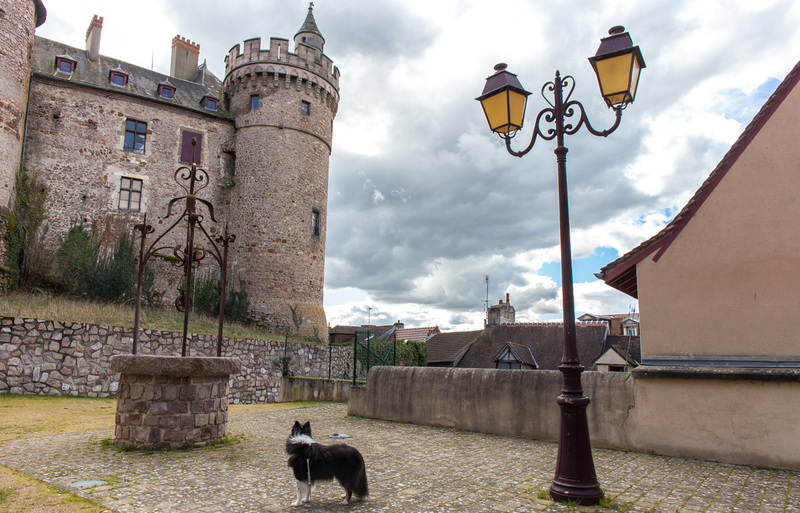 I was using the 24mm wide angle lens and trying to get the top of the castle and the lamp post and the dog all in the frame, semi-successfully. I can't do much correction without losing one thing or another, so this is it. "It" is beautiful. And Tash is adorable. I love her devotion... or her herding mentality. Good photo, makes me wish I were there.